Thursday we made the trip from the guesthouse near Castello di Brolio in Tuscany, to our swank hotel in central Florence. 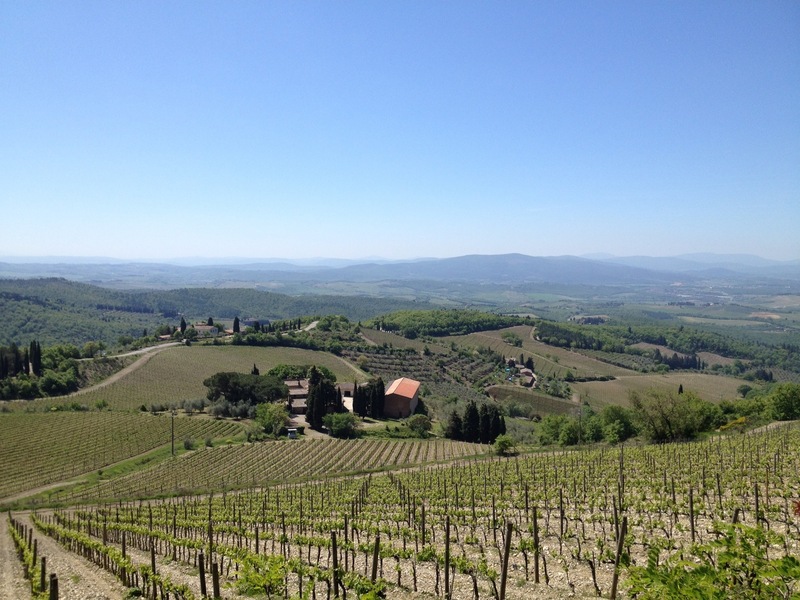 It was an easy drive; turned out to be quite spectacular really, since we purposefully deviated away from the ‘fastest’ route recommended by our GPS and took in some beautiful Tuscan panoramas as we drove across hilltops in the bright sun and blue skies. Who knew? The main route cuts through the valleys and mature Tuscan forests, while the more westerly route that we chose for our departure seemed to somehow connect peaks, hundreds of meters above. The entire trip was about 2 hours. All told the distance was only about 80 kilometers. I joked with my wife that the area we’d driven – Florence to Brolio, Brolio to Siena, Brolio to Florence, was within the greater Calgary city limits, and I’m probably not far off. Florence is a maze of tightly packed one way streets and roundabouts and dead ends. Designed hundreds of years ago, the streets were clearly not meant for cars. Scooters, pedestrians and aggressive taxi drivers compete for every square foot. It’s a bit of a nightmare. Upon entering the city core, which is a river with several bridges and the aforementioned crazy streets, our nav finally failed us. It tried to send us across a one way bridge the wrong way, and from that point on I was proactively skeptical. It was a bit dicey for the next 20 minutes as we could see our destination on the nav screen, but couldn’t get to it! After some persistence, crafty turning and driving on a sidewalk or two, we finally made it. I handed the keys to the very surprised concierge, who couldn’t believe we made it all the way to the hotel, and told them I didn’t want to see the car again until check out. They happily obliged. Our hotel, the JK Place hotel on piazza Santa Maria Novella, is a sparkling boutique hotel with tiny but opulent rooms and excellent service. Great location too. 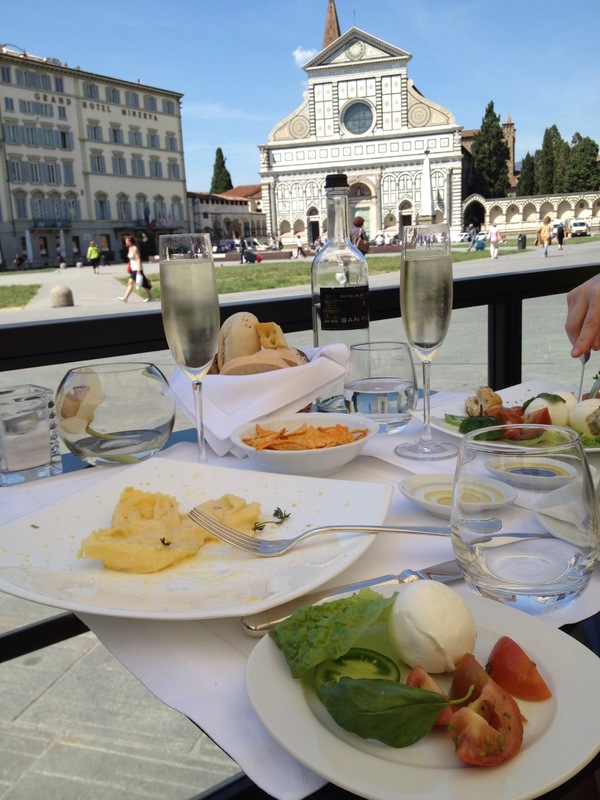 After checking in we planted ourselves on the hotel’s piazza terrace and drank our complimentary prosecco and dined on Caprese Salad and handmade raviolis. It was an evening well deserved. 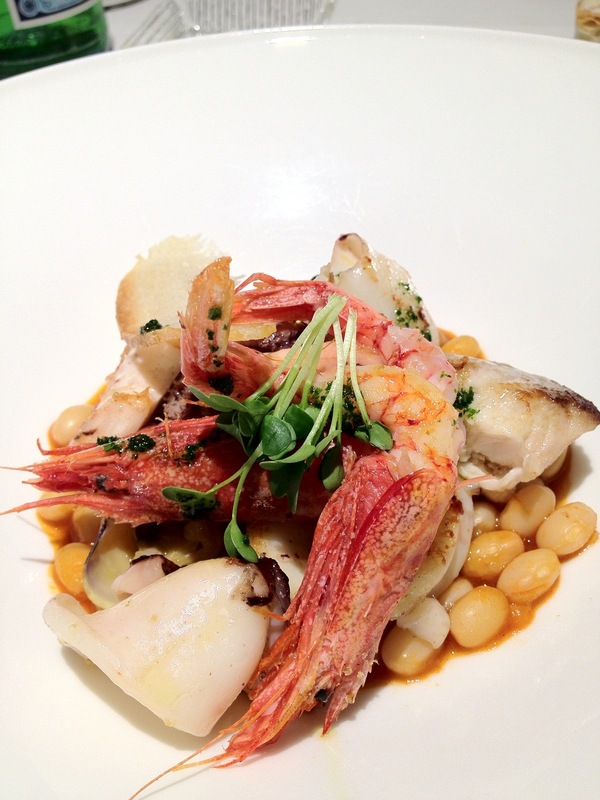 That night we dined at our first Michelin starred restaurant, the Ora d’Aria. The style of the food was modern takes on traditional Tuscan fare, and my wife and I both indulged in the 6 course seafood tasting menu. The food was indeed excellent and very creative. Fish soup with seaweed and salmon roe; fried ravioli with a chili sauce, seafood ragu with cod, squid, shrimp and perfectly cooked octopus, a consommé with micro squids… All very good. The service left a little to be desired, but we are learning that it was more typically Italian than poor unto itself. Apparently waiting 20 minutes is appropriate here. 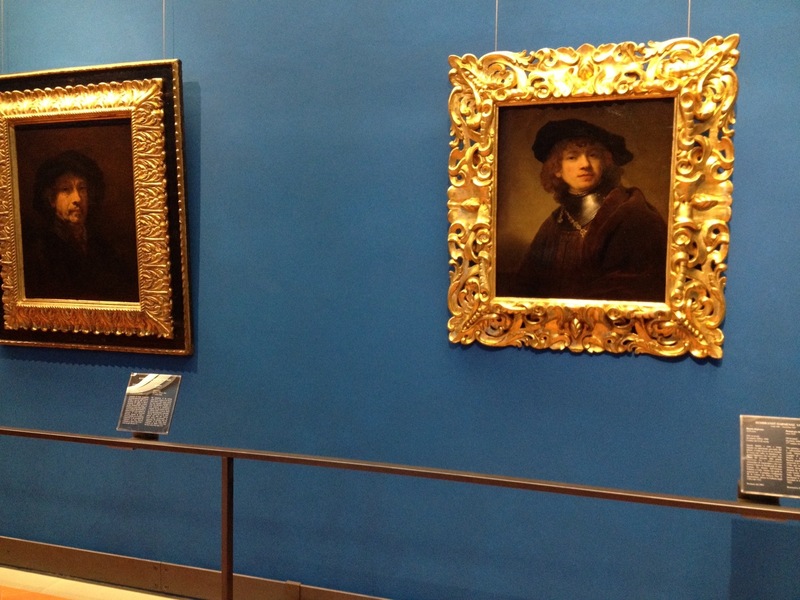 On Friday, we visited the Uffizi – one of Europe’s most celebrated museums, featuring timeless pieces back as far as the 12th century, Roman sculptures from 100AD and onwards, and incredible works by Renaissance masters including Michelangelo, Raphael and Rembrandt. But my favorites by far were from 16th century icon Botticelli. The museum had many of his pieces, covering the majority of his 40 year life and 30 year career, and it was very interesting to chart his stylistic maturation, not to mention the sheer perfection of his painting. 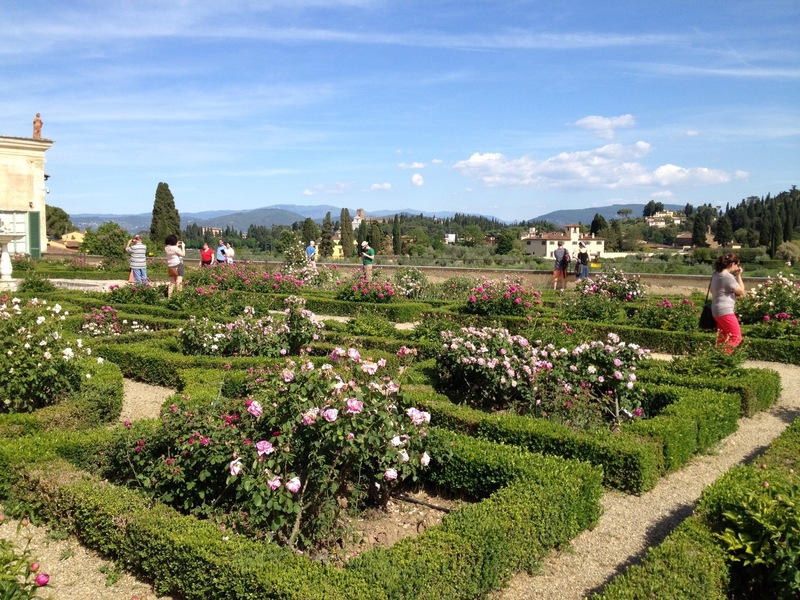 In the afternoon we checked out the Giardino di Bobboli which was the vast garden of the Medicis, former rulers of Florence in the 1500s. 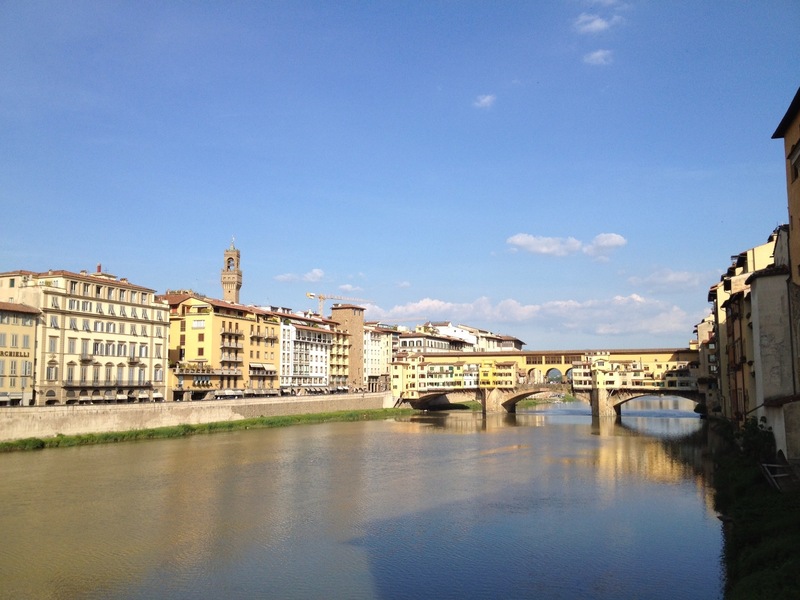 It covers several dozen acres behind the Palazzo Pitti, the Medicis’ enormous palace. Beyond a quaint rose garden, the property was in a shocking state of disrepair, looking more like a natural forest scene than a finely tuned garden, which left us disappointed. 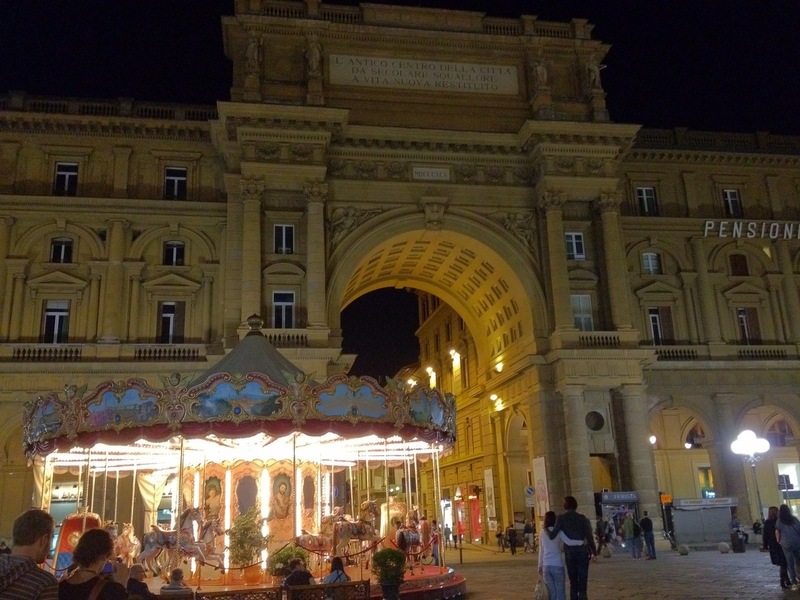 I would recommend you save your 10 Euros and avoid this attraction if you happen to be in Florence. Saturday morning, before leaving for Piemonte, we dropped in on the church of Santa Maria Novella, which our hotel faced. I’d noted that a few of the 500 year old paintings in the Uffizi had depicted the church, which was very cool indeed. So we thought we’d check it out. And boy was it amazing. 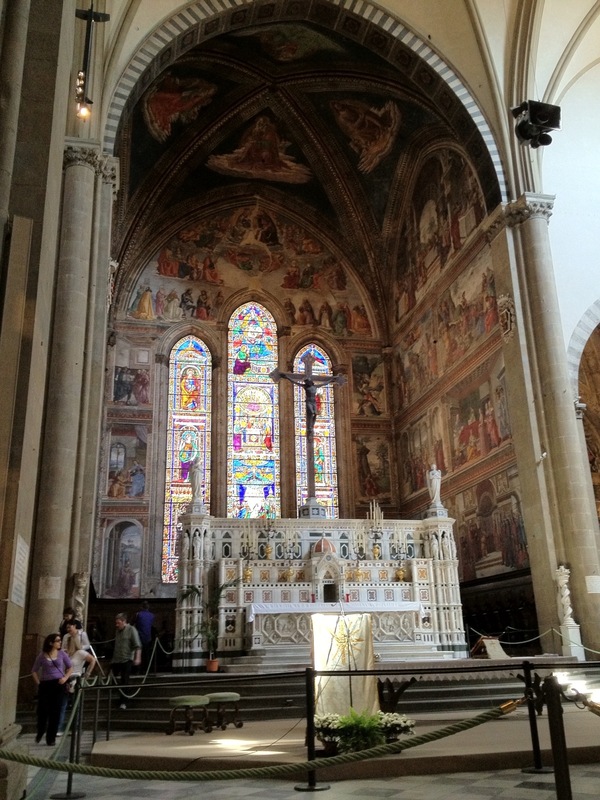 Again, many dozens of frescoes, huge canvases by prominent Italian artists, and mind blowing stained glass – much of which was created in the 1200’s when the church was built. One interesting thing I noted was how devoted to shopping the central city core is, and the Las Vegas-like sprawl of side by side high end boutique shops like Gucci, Fendi, Tiffany, Burberry, Armani, and others. There was nothing unique or proprietary about most of the shops, which was quite a deviation from the saturation of unique churches and museums.